Hi everyone, this is my first painting of 2013!. 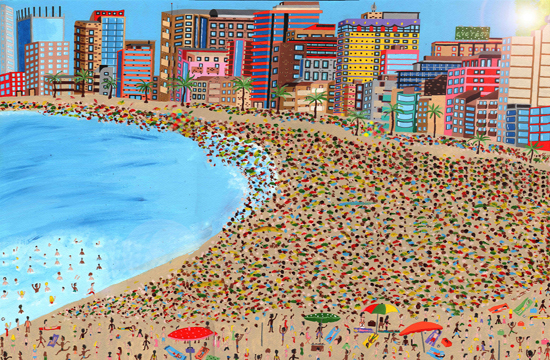 To bring in the New Year, I’ve created a painting of the stunning Rio Beach, in Rio De Janiero in Brazil. The image shows the jam packed beach at its best. Full of colour, heat, sand and water!. The high buildings showcase the many Hotels and luxury apartment complex’s. At the bottom of the image you can see various people all enjoying themselves either sunbathing, playing beach volleyball, eating some food and just general activities!. The painting has been completed on high grade, thick art painting paper with acrylic paints and is available to buy from the Gallery that represents me, www.degreeart.com . Read more about… Rio Beach.